Go ahead, say it out loud: sar-co-pee-nee-uh. The word may make you blush a bit, but it's merely the fancy medical term we use which means a loss of muscle tissue. Once you learn about age-related sarcopenia I think you'll agree that it's something you really do want to prevent, or at least minimize. In our modern, sedentary society, as we age through the decades a steady degradation is generally noted in the body: we tend to get progressively fatter, even though we may actually eat fewer calories than we used to. We get weaker and routine physical tasks become more challenging and ultimately impossible. We stumble and fall more often, get injured more frequently and don't recover readily. We run out of steam earlier in the day. We eventually become truly frail, fragile and fearful of activity. This is not a pretty picture, but it is indeed a valid generalization of the aging journey for too many of us. A variety of factors contribute to this downward spiral of vitality, durability and function, but sarcopenia is always a major culprit. Traditionally, we have considered age-related sarcopenia to be entirely biologically hard-wired and irreversible; after all, even aging horses and gorillas develop sarcopenia. But in modern humans, sarcopenia develops prematurely and is profoundly accelerated by our sedentary lifestyles. Therefore, we can, and should, do something about it. Aerobic fitness, though incredibly important, is inadequate. Health and functional independence require reliable, strong and powerful muscles, right on into our 90's and beyond. So what's the antidote for sarcopenia? Strength training, plain and simple. Studies suggest we should engage in some form of strength-enhancing activity at least twice a week; three times per week is much better. Strength training needn't be very time- consuming, nor complicated. 40 minutes of devoted strength training, three times per week, can make you very strong and you'll never regret it. And don't fret about getting bulky and looking like a fire hydrant - it simply won't happen, particularly if you maintain a high level of aerobic fitness. Strength training has an easy, short learning curve, but do make the effort to learn how to do it right. Hire a smart trainer for a few sessions and you'll be good to go. You'll learn that we now emphasize full-body strengthening with free weights and body weight workouts. The benefits of seated, artificial, machine-based training absolutely pale when compared to the profound functional benefits of multi-dimensional, compound training performed with body weight and free weight exercises. Sarcopenia. The word even sounds like a bad thing and it truly is. And only you can prevent it. I'll meet you at the pull-up bar and we'll get right to it. Optimum health cannot be bought, it must be earned and it comes with a price. The price of health is healthful living. There are many actions that one can choose to take in an attempt to achieve optimum health. This is a brief summary of the actions, that in our experience, really matter. 1. The Pleasure Trap, mastering the hidden force that undermines health and happiness, by Doug Lisle Ph.D. and Alan Goldhamer, D.C.
2. The Health Promoting Cookbook, by Alan Goldhamer, D.C.
3. The China Study, by T. Colin Campbell, Ph.D.
5. The Pleasure Trap Lectures on DVD, by Doug Lisle, Ph.D.
6. The McDougall Program by John McDougall, M.D. Do You Really Want To Be Fat for Life? Important new information that will help you understand the roadblocks to health and develop a plan for optimal health and happiness! If you are not already on it, we would like to introduce you to an exciting new diet program called "Fat for Life"! Would you like to eat whatever you want whenever you want it? Would you like your exercise program to be as easy as pressing the remote control button on your channel-changer? The Fat for Life program allows you to do whatever comes easiest for you. No thought or effort is required! Millions of Americans swear by the Fat for Life program, and now you can too! In fact, it was recently announced that for the first time in history the majority of adults in the United States are obese. This just shows how quickly the Fat for Life program is catching on. "But, aren't there risks associated with being fat?" you ask. Well, while it is true that at least 75-80% of all deaths in the United States are attributable to unhealthful diet and lifestyle choices, government officials, doctors, and even health associations often insist that the standard American diet is "healthy"! So, think positive! You may be among the lucky one-in-five Americans who won't suffer unnecessary illness and premature death. And besides, what is so bad about cancer, heart disease, strokes, diabetes, arthritis, and osteoporosis? Isn't that why you have health insurance? Admittedly, not everyone is comfortable being fat and sick. But that is no reason to forsake the Fat for Life program. If you don't like carrying the extra weight, you can get your doctor to give you appetite-suppressing drugs, or to staple your stomach. "But, you ask," doesn't research indicate that it may be more likely that my doctor can cure cancer than cure obesity?" Well, ask yourself this question: Why do you have to be so negative? Just think positive thoughts. Everything is exactly the way it is supposed to be. Go with the flow. By now, you can tell that we have been writing tongue-in-cheek. But doesn't what we have written sound all too familiar? Most people, even most physicians, are really in the dark when it comes to diet and nutrition. Fortunately, there is an easy-to-understand approach to weight loss, and it doesn't involve any pills, powders, potions, or other gimmicks. It does involve learning how to eat and to exercise in ways that are consistent with our natural history. That means eating a diet consisting of whole natural foods. It also means engaging in frequent, moderate exercise. Does our program work? At the TrueNorth Health Center, we have helped many people lose unneeded and unwanted fat, and keep it off, by following a few sensible guidelines. But before we describe our approach, let's look at why conventional diets don't work. One reason that diets don't work is that they contain foods that were never present in the natural environment! As a result, these foods - such as bread, cheese, crackers, "low-fat" chocolate shakes, margarine, and "light" beer - have the ability to fool the brain's natural appetite mechanisms. When this happens, people tend to over-consume, and that over-consumption is stored as fat. It is just about as simple as that. Our brains are built to sense the caloric value of foods we eat. When we've eaten enough, our hunger drive is designed to shut down naturally. Notice that you have never "accidentally" eaten 50 apples. Your body "keeps count" and shuts your hunger down at the appropriate time. The brain mechanism that organizes this feat is called the satiety mechanism. It was built into our psychology over countless generations, as part of our natural biological heritage. All creatures need to know both when they are "hungry" and when they are "full," so that they can live most effectively. The satiety mechanism appears to depend upon two types of receptors in our mouths and stomachs. These are stretch receptors, which give our brain information about how "stretched out" our stomach is, and nutrient receptors, which tell us the caloric density of the food we have eaten. Notice that if you eat four pounds of raw salad, you may feel "full" in terms of being "stretched out," but the nutrient receptors in your stomach also will be saying, "Hey, that was 'OK,' but it wasn't nearly enough! Get me some calories, or I'm going to continue to complain!" You might feel "stretched out" but still hungry. To be satiated, or hunger-satisfied, we have to have our stomach both stretched out and filled with some "real" calories. In the environment of our ancestors, the foods had moderate caloric density; that is, those foods both stretched the stomach and also caused significant nutrient signaling to the brain. People couldn't easily overeat on foods of moderate density because the stretching of their stomachs would hurt. Our ancestors ate everything they could, until they felt full, and then stopped eating! They never worried about overeating and getting fat (which might have been dangerous in a natural setting). They didn't need to be concerned about this because on a natural diet, people rarely get fat. Modern, processed foods tend to be more calorically dense than natural foods. They can fool our satiety mechanism! When people eat substantial quantities of processed foods, it is quite natural for them to overeat, because the stretch receptors in their stomachs are not getting much chance to signal "enough" - until too much has been eaten. Let's look at the caloric density of some popular foods. Raw vegetables, such as salads, contain about 100 calories per pound. Cooked vegetables, such as carrots, contain about 200 calories per pound. Fresh fruits contain about 300 calories per pound, and starchy vegetables and grains contain about 500 calories per pound. (See chart on p.12.) But breads, pizza, ice cream, and other processed products are usually between 1000 and 1500 calories per pound! A pound of bread, for example, has about 1200 calories! Because of processing, bread is a more concentrated product than grains or starchy vegetables. Therefore, when eating bread, there will be less stretch receptor activity in the stomach signaling for satiety than when eating grains, given the same caloric intake! Some examples might make this easier to understand. Which is easier to eat: a pint of ice cream, or five pounds of cooked carrots? Which is more likely to make you feel full: a pound of pizza, or eight pounds of cooked broccoli? Four ounces of chocolate, or three large baked potatoes? You can see that overeating is easy to do if concentrated, processed foods are prominent in the diet. Meats are also very concentrated - one of the few naturally concentrated sources of calories. Meat consumption was probably relatively unusual in the natural environment, and it packed a big punch at about 1200 calories per pound. In today's world, the Fat for Life crowd is eating a diet that predominately consists of processed foods and meat, fish, fowl, eggs, and dairy products. This guarantees that the caloric density of the average American's diet is much, much greater than their appetite machinery is built to handle! Any creature given a diet that is more concentrated than is appropriate for its design will tend to overeat - and get fat. Birds eating processed foods, for example, may fatten to the point that they can no longer fly. Given this perspective, it is hardly a surprise that over 50% of U.S. adults are obese; and another significant percentage are well above their optimum weight. A key strategy in any successful weight loss program is to treat your body in the way it was meant to be utilized. A top priority of this strategy is to eat a diet consisting of whole natural foods - fresh fruits and vegetables, and the variable addition of whole grains, raw nuts and seeds, and legumes. In addition to the many other health benefits, this dietary strategy will provide sufficient stretch receptor activity, resulting in satiety. With this dietary strategy, significant overeating is much less likely to occur. At the Center, for lunch and dinner, we recommend that meals be eaten in a particular order. First, eat a large, raw vegetable salad. Steamed vegetables should be eaten next. Finally, eat starchy vegetables and whole grains. There is a reason for this recommendation. We have observed that once a person gets a taste of higher-calorie foods (such as cooked grains), lower-calorie foods (such as raw salad) are suddenly less appealing. This can result in less salad and vegetable consumption, which, in turn, can cause an overall increase of the meal's caloric density. By starting with the least caloric foods - when we are the most hungry - more low-density food is consumed. This results in more stretching of the stomach, which helps us to feel full and thus less likely to overeat. Using this strategy, there is little need to be concerned about portion size. There is truly no need to "go hungry." By consuming the majority of calories from moderately concentrated, unprocessed, whole, natural foods, most of the "fat battle" is easily won. Combined with a moderate exercise program, this strategy really works - just as nature intended. We have found that our overweight patients tend to lose about two pounds per week using this strategy. Most medical researchers would consider our patients' successes to be "miraculous." We don't, but we are very pleased to see our patients consistently rewarded for following this "uncommon sense" approach to weight loss. We should add a few comments about exercise because some people place so much emphasis on it. We have seen people who exercise almost constantly, but still fail to lose weight. Exercise is a useful and important adjunct to healthful living and to weight control, but exercise alone is not enough. 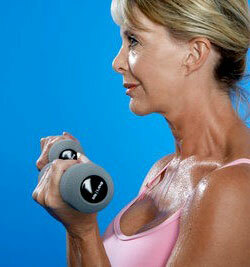 We recommend that our patients engage in moderate exercise 4-5 times per week. Actually, we think it is a good idea to exercise moderately almost every day, if you have the time. By "moderate" exercise, we mean an activity that causes you to have to work at it a bit. If you are an Olympic marathoner, it might mean a five-mile run. For most of our overweight patients, however, it probably means a brisk 20-30 minute walk. If our program seems "too good to be true," we're not surprised. While our diet and exercise strategies are very simple and easy to understand, they are sometimes difficult to implement. Many factors can get in the way, but the most potent obstacle that you face in conquering the Fat for Life challenge is your built-in "energy conservation programming. "Programmed for convenience foods, all animals, including humans, have energy conservation programming built into their nervous systems. The nature of this programming differs from species to species, but it is always there, nonetheless. Migratory birds, for example, will fly in a characteristic "V" pattern, so that they can use each other's bodies to break the wind - and save calories. Many fish swim in schools, saving calories riding in each other's wake. And predators, all over the world, are found to pick on the "weak," so that they get the greatest number of calories for the least amount of effort expended. Humans, too, have this type of programming as part of human nature. We are programmed to want to get as many calories as we can, with the least possible effort! This is great programming for humans living in an environment of scarcity, which is where almost all humans lived until just the last few decades. Now, however, most of us in the modern Western world are no longer living in an environment of scarcity. But our natural programming is still with us - encouraging us to eat as much as we can with as little effort as possible! Is it any wonder that obesity is an epidemic within industrialized societies? Your "natural" tendencies may be to eat the most concentrated foods available - and to exercise as little as possible. But you needn't be a slave to these tendencies. People are often able to over-ride them with some moderate effort. You can "use your head" to think ahead when it comes to your health and fitness. Plan ahead to have plenty of whole natural foods available at all times so that it is convenient, and schedule time to engage in regular, moderate exercise. No need for miracles you do not need a "miracle" to have a healthy, trim body. But you need to understand and respect how you were naturally designed to live. You were designed to consume a diet of whole natural foods - and engage in moderate, regular exercise. Your energy conservation programming may make it seem "unnatural" to live this way, but that is only because of the modern environment. Progress has made unhealthful living all too easy. You do not need to follow the herd, which is headed toward fatness and failure. By implementing these simple strategies, you can join the fortunate few who are fit - not fat - for life. Read more about Do You Really Want To Be Fat for Life? Health can best be described as an optimum state of physical, mental and social well-being, with the emphasis on optimum. Since health results from healthful living, the only way we can hope to achieve this optimum state of well-being - our personal health potential - is through ongoing conscious effort. We must provide our bodies with all of the requirements of health. At the same time, we must avoid, or at least minimize, the things that can compromise health-environmental stressors and our own destructive behaviors. Heredity plays an important role in determining a person's health potential. Unfortunately, we cannot change our inherited constitution, nor can we control any permanent effects of our former living habits. There are, however, four major components of healthful living we can control. To help remember them we use the mnemonic DEAP (pronounced like deep) which comes from their initial letters. The components are Diet: what and how we eat; Environment: how we select and modify our surroundings; Activity: how we exercise, rest and sleep; and Psychology: how we view ourselves and interact with others. We must learn to identify the specific requirements of health, as well as the stressors, for each of the four categories. Only then can we formulate effective strategies that lead to optimum health. Since all of these categories are worthy subjects in and of themselves, we will limit ourselves to a description of a number of key points for each. Diet is the sum total of all substances taken into the digestive tract. For most Americans, it is not difficult to get all the nutrients our bodies require, including protein, fat, carbohydrates, vitamins, minerals, fiber and water. A diet made up of a variety of fresh fruits and vegetables, raw nuts and seeds, whole grains, and legumes provides all the necessary nutrients in abundance. If our diets consist exclusively of these items in their whole, unrefined state, we will not only meet our requirements, but also avoid the numerous dietary stressors that can destroy health. Most importantly, we will avoid the excessively concentrated rich diet that is the main threat to health today. As a result of the aggressive marketing efforts of the meat and dairy industries we have been miseducated about the "necessity" of including animal products in our diet. This purported need for meat, fish, fowl, eggs and dairy products is in direct contradiction to mainstream scientific research that shows that these high protein, high fat, no fiber foods are detrimental to health. In fact, it is impossible to keep fat and protein intakes at optimum levels when animal products are eaten in significant quantities. Excess protein is associated with osteoporosis (loss of bone density) and kidney disease. Excess fat, especially the fat found in animal products, is associated with cardiovascular disease (heart attacks) and cancer (especially breast and colon cancer). Low fiber is associated with constipation and colon cancer. Incredibly, in spite of the facts, people are still being encouraged to consume animal products three or more times a day. Other dietary stressors include alcohol, tobacco, coffee, refined carbohydrates (including sugar and honey) and oils. Unfortunately these substances (with the possible exception of tobacco) are still socially acceptable, and it will take a little effort on our part to avoid them. But new, more accurate health education programs are beginning to draw attention to the health risks posed by these things and it is fast becoming more socially acceptable to abstain from them. It is tempting to ignore the environmental factors of health because they often seem beyond our personal control. But there are environmental factors we can and must control if optimum health is to be obtained and maintained. A health-promoting environment includes clean air, pure water, appropriate sunshine, and esthetics. It avoids environmental stressors including excess noise and toxic substances. We have quite a bit of control over each of these aspects. Air pollution is pervasive, especially in large cities. Individually we have several options for dealing with air pollution. We can move. We can purchase an air purifier for our home and perhaps for our place of employment. We can avoid smoky places. We can avoid using toxic chemicals, commonly known as household cleaners, in our homes. We can use respirators when exposed to paint and other fumes, etc. By carefully analyzing our daily routine we can eliminate a sizeable percentage of our exposure to air pollution. Similar strategies can be applied to other environmental concerns. To avoid the toxins associated with water, including heavy metal and pesticide contamination, toxic by-products from chlorination and fluoridation, etc., we can purchase or make purified or distilled water. Overexposure to ultraviolet radiation from the sun can be mitigated with the use of proper clothing, including wide-brim hats and sunscreen. Earplugs offer protection from high noise levels. The first step to take is to identify areas of potential environmental stress, then develop appropriate strategies to minimize or eliminate these stressors. The category "activity" includes exercise, rest and sleep. There is much confusion about the role that exercise and sleep play in health. Like diet, activity is an area where each person can take control. Vigorous physical activity puts demands on all body systems to work harder. The body responds to these demands by becoming stronger and more efficient. The health benefits of exercise include improved metabolism, increased muscle and bone strength, more efficient cardiovascular (heart and blood vessel) function, larger lung capacity, tension reduction, and improved sleep. The most efficient way to obtain these benefits is through regular aerobic exercise. Aerobic exercise involves the large muscles of the body, particularly the legs. Examples include brisk walking, jogging, swimming and bike riding. Exercise is most enjoyable when it is incorporated into recreation and becomes a regular part of your normal daily activities. The benefits of regular aerobic activity are becoming more widely understood and accepted; however, the benefits of sleep are often ignored. Sleep deprivation can suppress the body's immune system, and has been associated with depression. Healing activity is accentuated during sleep. Two aspects of sleep must be considered: quality and quantity. Many people just don't allow enough time for sleep. They regard it as a waste of time and use drugs such as caffeine to stimulate their exhausted bodies into action. Some people allow plenty of time for sleep, but the quality of their sleep is poor. Regular exercise is often effective in helping people improve their ability to fall asleep. Physically fit people spend more of their sleeping time in deep sleep, and in REM (rapid eye movement), or dreaming sleep, the more restorative stages of sleep. People who are getting enough sleep wake spontaneously and feel refreshed. Psychological health is characterized by high self-esteem and is dependent on two primary features: productive activity and effective interpersonal skills. Productive activity is any life-enhancing activity that you feel is worthwhile and that is performed to the best of your ability. The positive feedback of successfully performing tasks increases feelings of well being and promotes self-esteem. This process begins in childhood with simple activities and builds in complexity as skills are mastered. The satisfaction and pleasure of successful performance is sometimes lost as people grow older and perceive themselves to be doing meaningless tasks that they attempt to accomplish with the least possible effort. Lack of meaning and effort are damaging to psychological health. Effective interpersonal skills are the tools that enable people to get what they need and want from life. A baby cries to let others know its simple needs. Older children are much more skillful and subtle in their communication. Adults require a large, complex array of skills to effectively interact with fellow workers, friends and family. Each type of interaction requires different skills if the relationship is to be successful. These skills are learned to differing degrees in the process of growing up. They can be refined and improved by adults who are striving for a more satisfying lifestyle.